Why "In-trays" are the enemy! Recently there was an advert on TV for a large office supply retailer which said "Get your office organised with these stackable in-trays", and I would cringe every time I saw it! 99% of the time, in-trays are part of the problem, NOT the solution, and it is very rare to come across people who are using in-trays effectively. In my opinion, the only thing in-trays are good for is storing "virgin" stationery - reams of paper, blank forms, envelopes, sheets of labels, and so on. 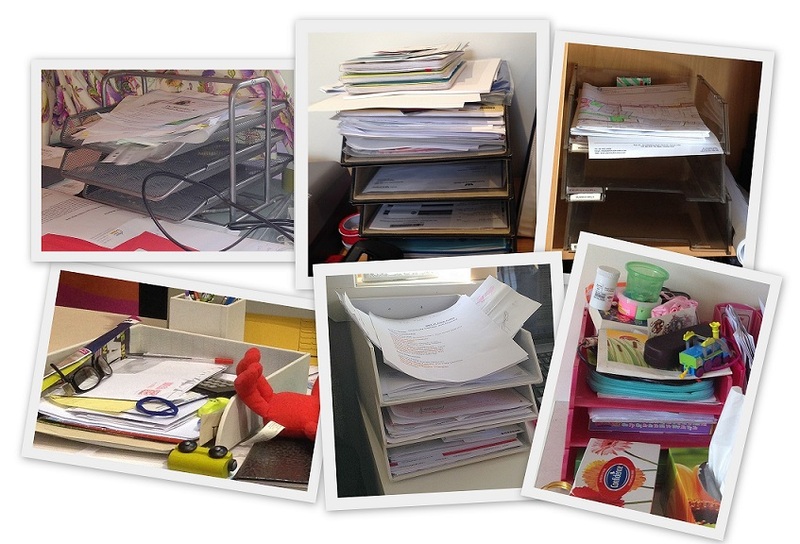 This is because the contents are then uniform throughout - you can always just take the one on the top of the pile. As soon as you are having to flick through the pile trying to find something, you know you have a problem. How many times have you gone through the contents of your in-tray over and over again before finding that one piece of paper you need? You can waste so much time and energy on this "system". Time to think vertical! Vertical systems are so much easier to use than horizontal systems, as it is much easier to see and access what's there, and much easier to add new items in a meaningful place, rather than to the top of a jumbled pile. Now you have a clear place for everything, a system that flows easily, and you can find what you need when you need it. No more over-stuffed nonsensical in-trays = happiness!